“Diclo” redirects here. For the organic solvent sometimes called Di-clo, see Dichloromethane. Diclofenac is often used to treat chronic pain associated with cancer, especially if inflammation is present. Diclofenac can be combined with opioids if needed such as a fixed combination of diclofenac and codeine. 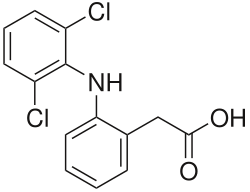 Diclofenac may also be a unique member of the NSAIDs. Some evidence indicates it inhibits the lipoxygenase pathways, thus reducing formation of the leukotrienes (also pro-inflammatory autacoids). It also may inhibit phospholipase A2 as part of its mechanism of action. These additional actions may explain its high potency – it is the most potent NSAID on a broad basis. Use of diclofenac for animals is controversial due to toxicity when eaten by scavenging birds that eat dead animals; the medication has been banned for veterinary use in many countries. Use of diclofenac in animals has been reported to have led to a sharp decline in the vulture population in the Indian subcontinent – a 95% decline by 2003 and a 99.9% decline by 2008. The mechanism is presumed to be renal failure; however, toxicity may be due to direct inhibition of uric acid secretion in vultures. Vultures eat the carcasses of livestock that have been administered veterinary diclofenac, and are poisoned by the accumulated chemical, as vultures do not have a particular enzyme to break down diclofenac. At a meeting of the National Wildlife Board in March 2005, the Government of India announced it intended to phase out the veterinary use of diclofenac. Meloxicam is a safer alternative to replace use of diclofenac. It is more expensive than diclofenac, but the price is coming down as more pharmaceutical companies begin to manufacture it. “The loss of tens of millions of vultures over the last decade has had major ecological consequences across the Indian Subcontinent that pose a potential threat to human health. In many places, populations of feral dogs (Canis familiaris) have increased sharply from the disappearance of Gyps vultures as the main scavenger of wild and domestic ungulate carcasses. Associated with the rise in dog numbers is an increased risk of rabies“ and casualties of almost 50,000 people. The Government of India cites this as one of the major consequences of a vulture species extinction. A major shift in the transfer of corpse pathogens from vultures to feral dogs and rats could lead to a disease pandemic, causing millions of deaths in a crowded country like India, whereas vultures’ digestive systems safely destroy many species of such pathogens. Vultures are long-lived and slow to breed. They start breeding only at the age of six and only 50% of young survive. Even if the government ban is fully implemented, it will take several years to revive the vulture population. Solaraze (3% diclofenac sodium gel) is topically applied, twice a day for three months, to manage the skin condition known as actinic or solar keratosis. Parazone-DP is a combination of diclofenac potassium and paracetamol, manufactured and supplied by Ozone Pharmaceuticals and Chemicals, Gujarat, India. It is sold in Uruguay alone or, in combination with orphenadrine to treat muscle spasms/pain due to injuries (Dicloflex Ion). ^ a b “Diclofenac”. Drugs.com. Retrieved 22 December 2018. ^ a b c d e f g h i “Diclofenac epolamine Monograph for Professionals”. Drugs.com. AHFS. Retrieved 22 December 2018. ^ a b c d British national formulary : BNF 74 (74 ed.). British Medical Association. 2017. pp. 1033–1035. ISBN 978-0857112989. ^ Fischer, Janos (2006). Analogue-based drug discovery. Wiley-VCH. p. 517. ISBN 978-3527312573. ^ a b “RUFENAL”. Birzeit Pharmaceutical Company. Archived from the original on 2011-05-26. ^ “Diclofenac (Topical Application Route) Description and Brand Names – Mayo Clinic”. www.mayoclinic.com. ^ “WHO – WHO’s cancer pain ladder for adults”. www.who.int. ^ a b c d e f g h Bhala, N.; Emberson, J.; et al. (2013). “Vascular and upper gastrointestinal effects of non-steroidal anti-inflammatory drugs: meta-analyses of individual participant data from randomised trials”. The Lancet. 382 (9894): 769–779. doi:10.1016/S0140-6736(13)60900-9. PMC 3778977. PMID 23726390. ^ “Heart risk warning over painkiller”. BBC News. 29 June 2013 – via www.bbc.co.uk. ^ Becker, Rachel (2016). “Cattle drug threatens thousands of vultures”. Nature. doi:10.1038/nature.2016.19839. ^ a b Cryer, B.; Feldman, M. (1998). “Cyclooxygenase-1 and Cyclooxygenase-2 Selectivity of Widely Used Nonsteroidal Anti-Inflammatory Drugs”. The American Journal of Medicine. 104 (5): 413–421. doi:10.1016/S0002-9343(98)00091-6. ^ a b “Saving the Vultures from Extinction” (Press release). Press Information Bureau, Government of India. 2005-05-16. Retrieved 2006-05-12. ^ Becker, Rachel (2016). “Cattle drug threatens thousands of vultures”. Nature. doi:10.1038/nature.2016.19839. Retrieved 2 May 2016. ^ International, BirdLife. “Vulture killing drug now available on EU market”. www.birdlife.org. ^ Altman, R; Bosch, B; Brune, K; Patrignani, P; Young, C (May 2015). “Advances in NSAID development: evolution of diclofenac products using pharmaceutical technology”. Drugs. 75 (8): 859–77. doi:10.1007/s40265-015-0392-z. PMC 4445819. PMID 25963327. ^ “Oral diclofenac presentations with legal status ‘P’ – reclassified to POM – GOV.UK”. www.gov.uk.